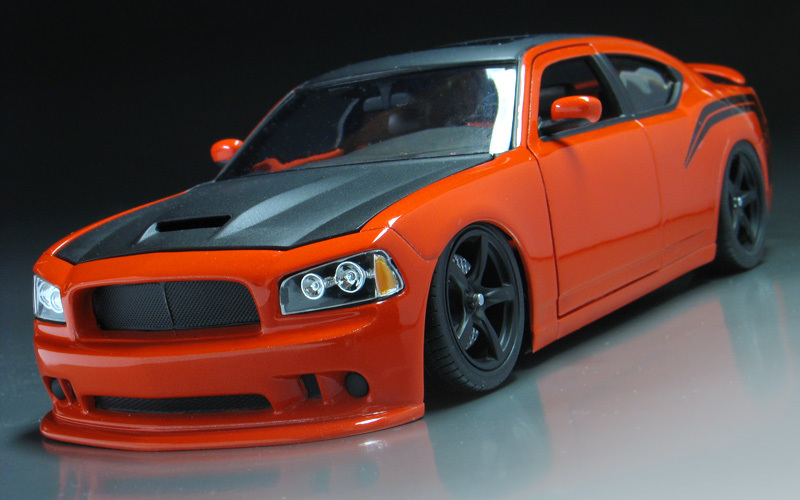 I've always liked the aggressive styling of the LX based Dodge Chargers. They look really mean and I think the lines really lend themselves well to the muscle car treatment. 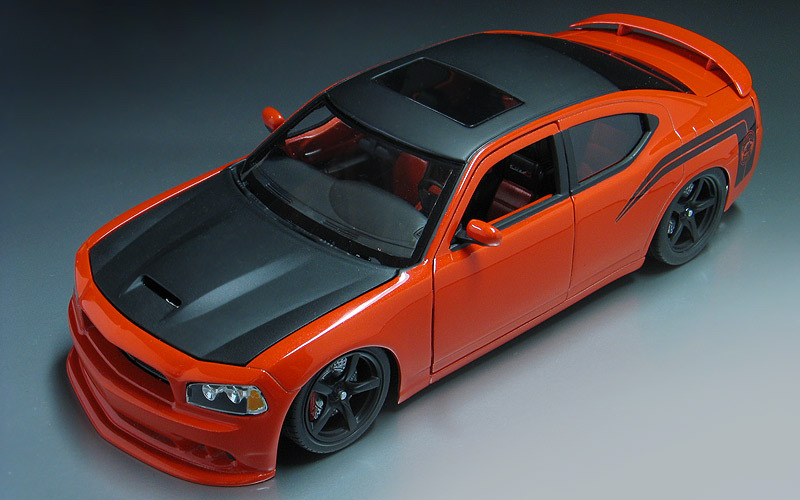 Eventually Dodge did build a factory Super Bee version of this car but, I wanted to make my own Super Bee version with an even more muscular look and add some of the classic Mopar muscle design cues. 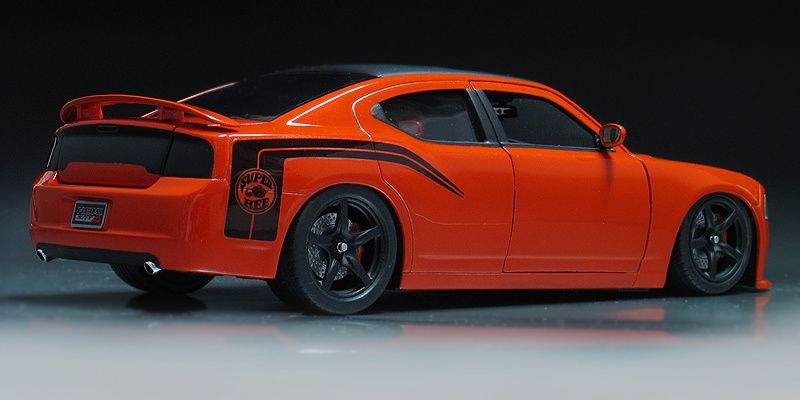 So, I started with Revell's 1/24th scale Charger SRT-8 kit, which actually a very nice kit once you get past some of it's toy-like features. The first order of business was the body mods. 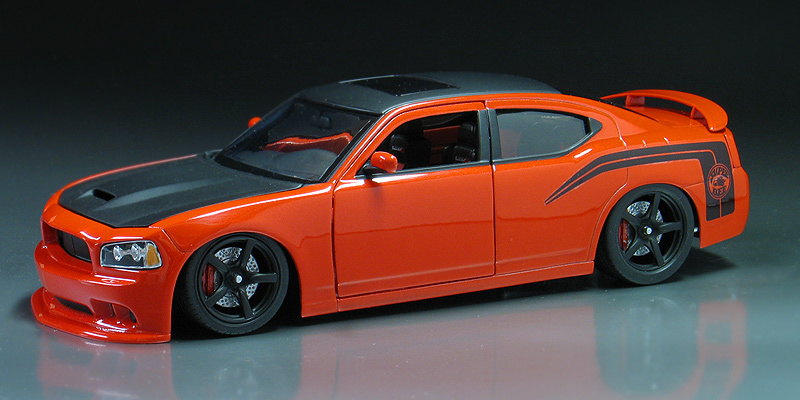 First, I removed the body side moldings for s cleaner look. Then I decided to use the kit's custom grill, but modified it so I could mount it behind the front fascia for a tunneled look, similar to what the '68-'70 Chargers looked like. Since I wasn't going to use the kit's Lambo doors feature. I went ahead and glued them shut. 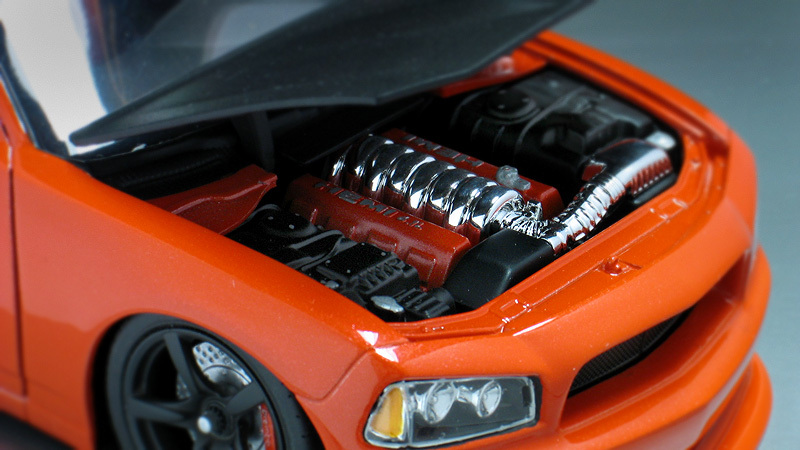 Lastly, I also opened up the kit's molded closed SRT-8 hood scoop with a dremel tool. 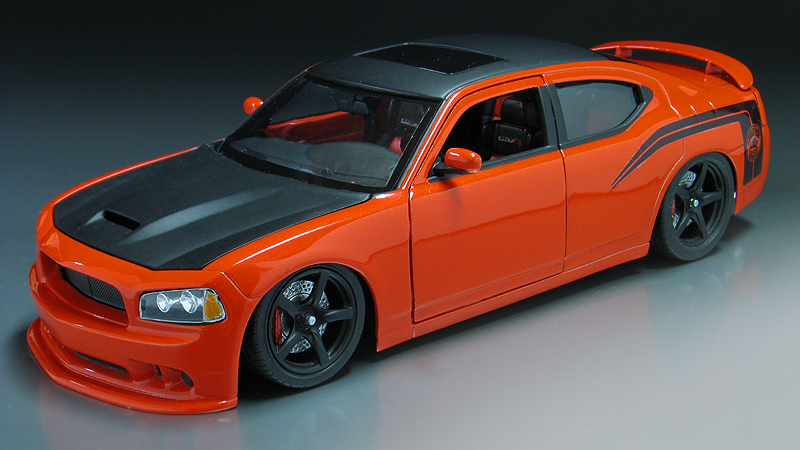 Next, I created my own Super Bee custom striping design own my computer and then printed my own decals for it. 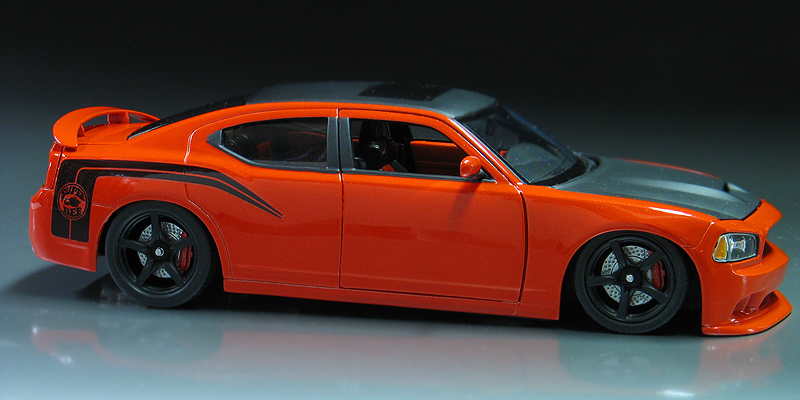 The paint color I chose was Testor's Hemi Orange lacquer which was a factory High Impact color for 1971. This color has a small amount of pearl in it that really pops under sunlight. This was gloss coated with PPG urethane clear. Then finally I applied flat black to the hood and top. 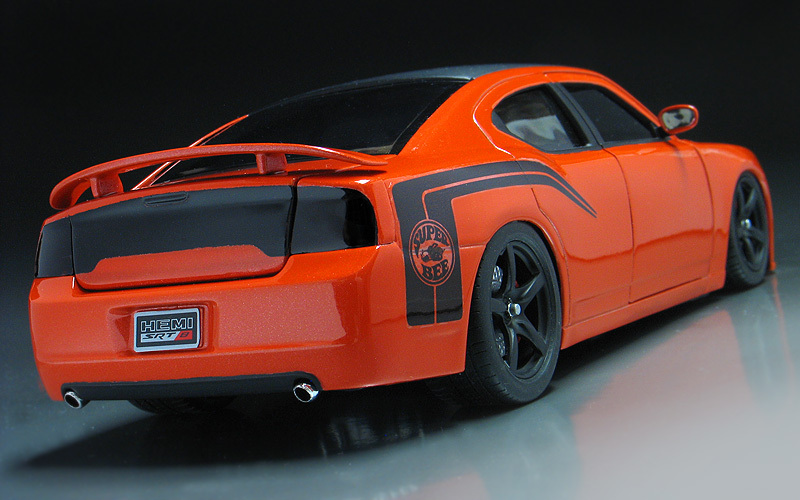 As another nod to the vintage Chargers, I blacked out the taillights and the trunk panel which also makes it look similar to the newer 2012 Dodge Chargers. Revell's kit comes with a set of 24" donk style wheels. I replaced those a smaller more appropriate set of staggered 20" wheels from a Tamiya Porsche Carrera GT kit. Those were painted flat black as well. I also added a set of Brembo brakes with cross drilled rotors. 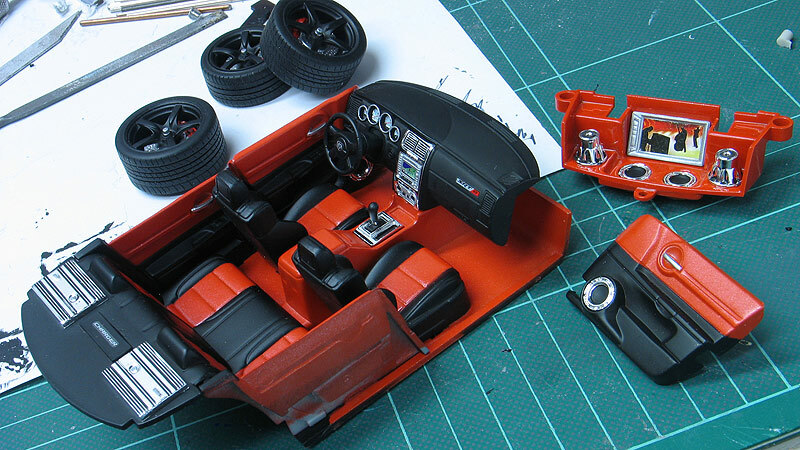 These are my own resin pieces that I re-cast from a Tamiya Mercedes CLK race car kit. Next, I slammed the suspension so I could get that super low stance. 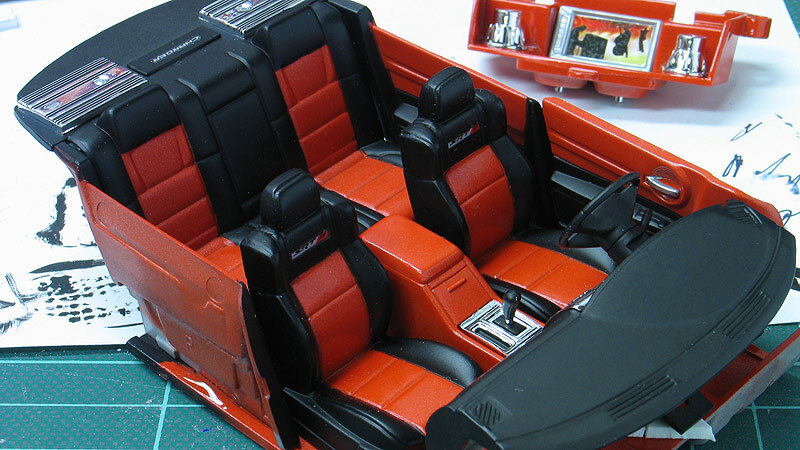 The rest of the kit was built out of the box including the opening trunk and simple engine detailing.